I've been thinking about patterns a lot lately. It all started when the kidlings were helping me tidy up. Through a typical parent/child miscommunication (the kind where a kid's brain translates, "Please run upstairs and change your socks" into "Please run upstairs and change your socks and then play Pioneer Girl and wash the dirty socks in the bathroom sink with extra soap and wear a funny bonnet for extra authenticity and be sure to make Mommy wait for 20 minutes wondering how long it takes to change your socks.") my book of patterns was lost for a heart-stopping 20 minutes. At the other end of the spectrum, I've been struggling with a lack of knitting patterns lately. I was always a knitter firmly wedded to a pattern. The connection between a specific yarn and a specific pattern was absolute. Then I started spinning and ending up with lovely yarn that had no pattern to go with it. What to do? to knit 2 garter stitch scarves that were awful. Far too wide and just the right length do be supremely annoying. So the poor scarves just sat there and moped. Then I got Lexi Boeger's Intertwined from the library and it really helped me to "listen" to my yarns and let them guide me. So I unraveled (frogged?) 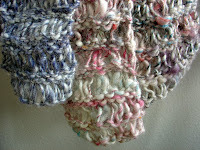 the scarves, reknit them and I'm so pleased with the outcomes! It's still a garter stitch scarf, but I re-knit it half as wide and it looks (and wears) so much better! The narrower width concentrates the colors so much more and blocks are in more pleasing proportions. 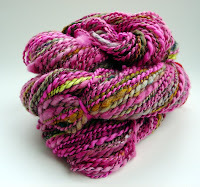 The yarn was made with one of Hobbledehoy's Happy Batts and pink roving from bethbrown. I knit this one with a drop stitch and I love how airy it is. 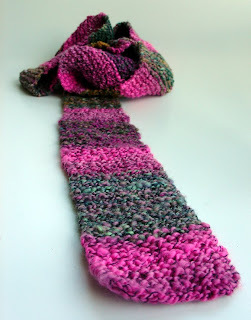 The drop stitch accentuates the lovely candy striping of the yarn. I probably should have reset the twist after unraveling the yarn so it wasn't so squirmy. But I kind of like the squirms. 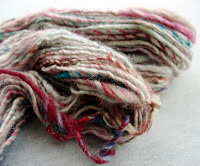 This yarn was spun from one of artclub's surprise batts. So that's my pattern patter for today. Anything you'd like to patter about? I just stumbled across your blog and read this post and it made me smile because I used to pretend I was a pioneer girl when I was little. I enjoy knitting scarves too. Your's are very pretty! I have a yarn addiction, but I do not really enjoy knitting. I have to try very hard to not look in any of etsy's yarn shops, because I will buy yarn with no plan at all. Then I end up making stubby little scarves. Your scarves are very pretty. 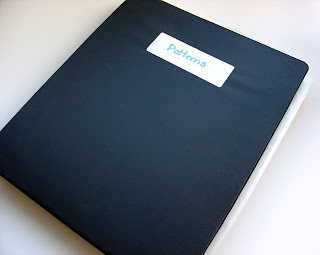 I think it's great you have all your sewing patterns in one place...mine are scattered in several notebooks, napkins, gas receipts...etc. 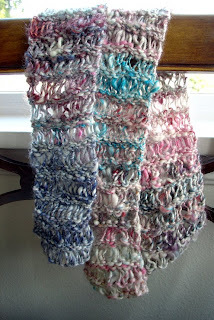 Love the drop lace scarf --- it's a great stitch that looks beautiful, yet works up quickly. You sound like such a great mom :)I am jealous of your tidy pattern book, I am scattered. I am the opposite kind of knitter, I almost never use patterns, which means I am often frogging to redo projects better. Sometimes I write things down though, in case I come up with something good and I want to repeat it!